Here’s a quick and easy recipe to enjoy when you want a break from rich holiday fare. Dried shiitake mushrooms provide depth of flavor and star anise lends its unique tangle of licorice, resin, and smokiness to this Asian-inspired split-pea soup. Ginger juice and watercress leaves offer bright finishes of taste and color to the soothing, familiar backdrop of split peas. 1. Place the shiitake and star anise in a large glass measuring cup and pour the 2 cups boiling water over them. Cover and set aside until the mushrooms are tender enough to cut, usually about 10 minutes. Lift out mushrooms and star anise with a slotted spoon. Slice the caps thinly, discarding any stems (they are too woody to eat) as you go. Set the shiitake, star anise, and soaking liquid aside. 2. Heat the oil in a 6-quart or larger pressure cooker. Add the white part of the sliced scallions, the onion, and the garlic, and cook over medium-high heat, stirring frequently, until they soften slightly, about 2 minutes. Add the sherry and cook over high heat, stirring constantly, until the sherry evaporates, about 30 seconds. Add the 4 cups of water, split peas, sliced shiitake, star anise (discard any broken pieces), and salt. Pour in the shiitake soaking liquid, taking care to leave behind any grit on the bottom of the cup. 3. Cook at high pressure for 10 minutes. Allow the pressure to come down naturally. 4. While the soup is cooking, prepare the ginger juice: trim and grate the ginger. Once you have about a tablespoon, press to grate ginger, use a porcelain grater, available in Asian groceries, or the side of a box grater with rice-sized holes. 5. Once the pressure is down, remove the lid and stir in the ginger juice, scallion greens, watercress, soy sauce, and toasted sesame oi to taste. Garnish individual servings with black sesame seeds, if you wish. The generous supply of meaty shiitake makes this soup substantial enough to serve as the main course. Opt for small shiitake-with dried caps no more than 1 inch across-if you can find them, as they rehydrate quickly. (About 10 of this size weigh ¾ ounce). If using larger ones, you may need to soak them longer; chop them into bite-sized morsels. 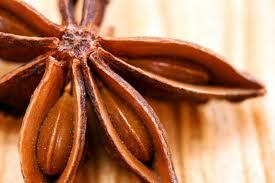 You’ll find dried shiitake and star anise in Asian groceries and in some health-food stores. 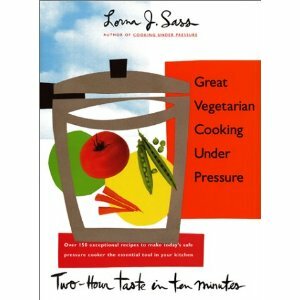 It did my heart good to read a new review of Great Vegetarian Cooking Under Pressure posted recently on Amazon. The reviewer really captures so much of what I tried to accomplish in writing it, and she also points out rightly that the book is actually vegan! You may not believe it, but when the book was published over 15 years ago, no one knew what the word “vegan” meant! I’m glad the reviewer especially liked the Thai chickpea recipe. It’s one of my favorites. And I agree that the creamy texture of pressure-cooked chickpeas is really sublime. Here’s the review: I had never used a pressure cooker before buying this book so I was a little scared to try it out. Sass explained everything so clearly that I was able to use the pressure cooker with no problem even on the first attempt. Every recipe I have tried has been sooooo delicious. She definitely has a way with spices and flavor combinations. As other reviewers have said, the recipes just work, without the need to tweak. I’ve tried several, but my favorites so far are the Thai Chickpeas and the Paella. I am never using canned chickpeas again, the texture is so creamy from the pressure cooker. And there are soooo many recipes that I can’t wait to try. Sometimes when you open a new cookbook you only find 5 or so recipes that you would actually attempt – almost all of the recipes in this book are appealing to me. Also, the recipes are actually vegan, not just vegetarian (except for a few that have the option of parmesan). I love that it doesn’t require a lot of vegan fake meats or cheese, but is real, whole foods. I can’t wait to get my hands on her other vegan cookbook! Here is a festive recipe for the holidays that puts the dried fruit shriveling up in your pantry to good use. Serve the compote on its own or as a topping for vanilla ice cream or coconut sorbet. Yum, and how easy can it get? Place 4 cups water in cooker along with 12 dried figs (halved), 2 cups tightly packed mixed dried fruits (cranberries add nice color), and 2 tablespoons chopped crystallized ginger. Cook under high pressure for 5 minutes. Quick release the pressure. When the compote has cooled slightly, stir in 1 cup toasted pecans or walnuts. Serve warm or room temperature. While developing the recipes for PRESSURE PERFECT, I experimented with a technique I came to call Triplex Cooking. It’s a kind of layered cooking that enables you to make three different foods at once. You’ll need a 6-quart or larger cooker, and this this technique has all sorts of applications for making a whole meal at once–you’ll find some more ideas in the book. But steamed it is, in the cooker’s vegetable basket–or use a bamboo or standard collapsible steaming basket instead. Rather than setting the basket on a trivet, balance it on some chunked potatoes. Then wrap carrots in an aluminum foil packet and set the packet on top of the meatloaf. The foil packet retards the cooking, and the carrots steam in their own minimal moisture, ending up with intense flavor. You can mash them with the potatoes are serve them separately in chunks. After cooking, remove the foil packet and slice the carrots. Lift out the meatloaf and then tip out some of the liquid and smash the potatoes with some cheese. The whole meal made in one pot in ten minutes under pressure: It’s as simple as that. So, maybe you can’t afford a triplex co-op or a three story house, but if you own a 6-quart or larger pressure cooker, you can do triplex cooing. Ha! Coat the bottom and sides of the steaming basket lightly with cooking spray or oil. Transfer to the steaming basket and press into a disc of uniform thickness. (If your steaming basket has a central lifting pole, either remove it or shape the loaf around it.) Spread a very thin coating of catsup on top. Pour 2 cups of water into a 6-quart or larger cooker. Place the potatoes in the water. Set the steaming basket with the meatloaf on top of the potatoes. Wrap the carrots tightly in foil and set them on top of the meatloaf. Lock the lid in place. Over high heat bring to high pressure. Reduce the heat just enough to maintain high pressure and cook for 10 minutes. Turn off the heat. Quick-release the pressure. Remove the lid, tilting it away from you to allow steam to escape. Use tongs to lift the foil-wrapped carrots. Check the meatloaf for doneness: an instant-read thermometer inserted into the center should read at least 155 degrees. If the meatloaf requires more cooking, nestle (but do not lock) the lid in place and steam over high heat for another few minutes. Lift the meatloaf basket from the cooker, garnish with parsley, and let rest in the basket for at least 5 minutes before slicing. Meanwhile, prepare the potatoes: Drain the potatoes and return them to the empty cooker. Set over very low heat. Add the cheese and milk. Use a masher to coarsely smash the potatoes. For a moister mixture, stir in additional milk. Add salt and pepper to taste. Unwrap and slice the carrots. To serve, either unmold the meatloaf or slice it right in the basket. Serve the Cheddar-Smashed Potatoes and carrots alongside. Hi all of you fans of the pressure cooker! Now that it’s holiday season, I imagine that your cooker is going to get lots of use. Thanks to Sigrid Trombley, a big fan of the “pc,” I have some new scrubbing advice to share with you to keep that cooker shining like new. I haven’t had a chance to try these out, so please let me know via the comments if you like them–or add your own scrubbing advice. Oh, and when you store the clean cooker, never lock the lid in place. This is not good for the gasket and keeps the aromas of your last meal alive. Store the lid upside-down on top of the cooker or elsewhere. Happy cooking and happy holidays! NOTES FROM SIGRID: Dawn Power Dissolver has 41 reviews on Amazon, 39 are 5 star and the two that are not have nothing to do with the product quality. Note, Dawn Power Dissolver is not to be confused with the various versions of regular Dawn diswashing liquids that are readily available in most supermarkets. I read about Dawn Power Dissolver online and checked numerous stores in Wichita for it and could find it nowhere. Amazon purchasers have said the same thing. I have no idea why it’s so difficult to find. I also have and use Bar Keeper’s Friend, which is readily available, but Dawn Power Dissolver will remove “stuff” that BKF will not. The Chore Boy Longlast Scrubber is also a favorite product of mine and I had to get it online as well though you might find it locally. I particularly like this product because the sponge side of the scrubber is the kind of sponge that is really absorbent unlike plastic sponges which are not very absorbent. Well, it’s officially winter in New York City. After a few balmy days earlier this week, I donned my down coat and started dreaming about making winter soups and stews–in the pressure cooker, of course. I am a big fan of large limas. They are double the size of baby limas, have a creamier texture, and better flavor–almost like little potatoes. I keep of bag of dried limas on hand as soon as the temperature drops below 50. Saute 1 sliced leek (including green leaves!) or a chopped onion in a tablespoon of oil. Add 4 cups chicken or vegetable broth and 3 cups water, 1 lb. large dried limas, the thinly sliced stems of a bunch of kale (leaves will be added later), and a small (3/4 lb), bone-in turkey thigh. Cook at high pressure for 14 minutes, then let the pressure come down naturally. Remove the turkey and stir in the chopped kale leaves, 2 to 3 tablespoons coarse-grained mustard, 1 tsp. dried sage if you like, and salt to taste. Simmer uncovered until kale is tender, 5-8 minutes. Stir in 1 1/2 cups frozen corn. Shred turkey and add. Adjust seasonings and serve. 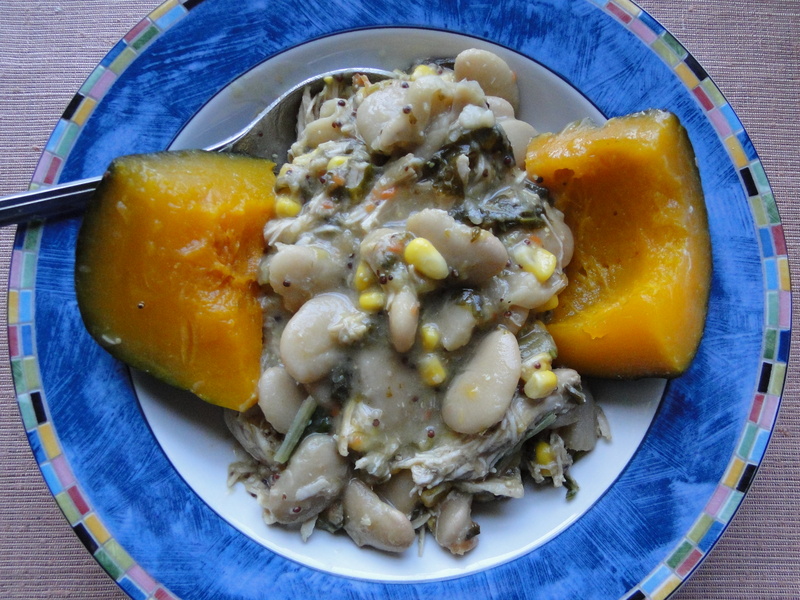 It’s nice to garnish the stew with some roasted squash. 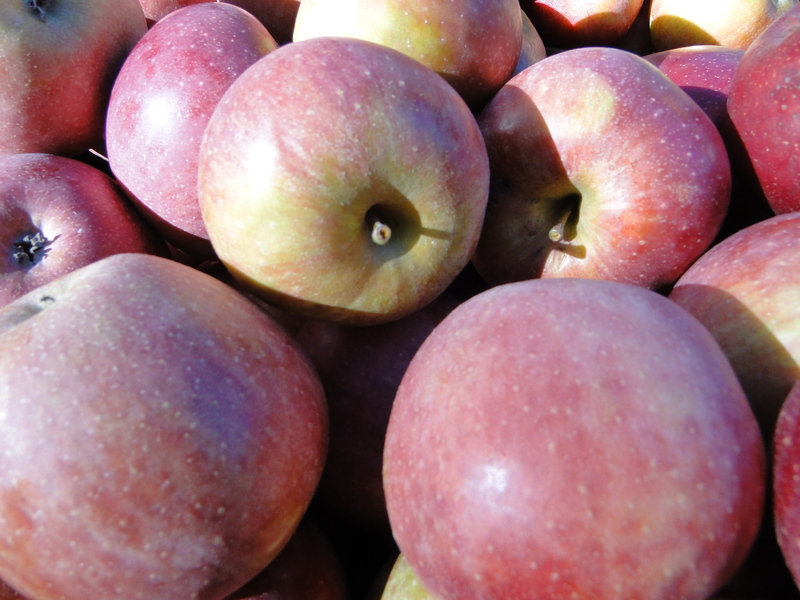 Every fall, the farmer’s market a few blocks from my home sells 4-pound bags of perfectly delicious, just slightly imperfect apples for $3. What a steal. Who can resist, especially when applesauce is so easy to make in the p.c. Last year I discovered that by adding some crystallized ginger, I could take homemade applesauce from very good to sublime. Here’s what you do: Pour 1/2 cup water in the cooker. Slice large chunks of apple around the core. Discard the cores and toss the apples into the cooker. For about 4 pounds of apples, add 3 to 4 tablespoons coarsely chopped crystallized ginger. Bring up to high pressure, then immediately turn off the heat. (If using an electric stove, move the cooker to a cool burner.) Wait about ten minutes for the pressure to come down naturally, remove the lid, and give it a stir. That’s all folks! Eat warm with vanilla icecream or cool, then refrigerate for up to 10 days. Have some with your morning oatmeal or even better, with steel-cut oats. Enjoy! My sweetie Michael, who shops in Indian groceries with the thoroughness that I reserve for consignment shops, recently discovered a spice blend called Sambhar Masala and gifted it to me. A whistling pressure cooker??? I’d seen these instructions before in Indian cookbooks. Some of you who have read the introductions to my pressure cooker books may remember that I was introduced to pressure cooking when my mother brought a cooker back from India around 1986. It was a cheap, tinny thing and I never got to try it, having been seduced quite quickly by the high-end cookers that were already available in the States. After some sleuthing, I discovered that many cookers made in India have jiggle-top-style pressure regulators. Once the pressure in up, the cooker toots a whistling sound. Then the cook turns down the heat and the cooker is designed to repeatedly whistle at regular intervals. Indian cooks listen out for the whistles and time their dishes accordingly. I’m a person who reveres silence, so although I’m charmed by the notion of a pressure cooker that whistles, I don’t think I’d want to own one. But I’m sure other folks feel differently about cooking sounds. As a matter of fact, when COOKING UNDER PRESSURE first came out in 1989, I remember being on a radio show touting the newly designed, safe cookers–making a special point about how quiet they were. A listener called in and said rather adamantly that she was not in favor of quiet cookers because one of the fondest childhood memories was the chuga-chuga sound of her mom’s cooker on the stove. I’d love to hear from any of you who have fond memories of whistling cookers. In the meanwhile, I for one know that the food comes out tasting great no matter what language the pressure cooker speaks. I just got the word from my publisher that PRESSURE PERFECT is going into its 18th printing. WOW! This news delights me beyond words because it means that more and more Americans are casting their fears aside and becoming devotees of the pressure cooker–saving time and fuel at the same time. I also sense this because I’m getting lots of subscriptions to this blog. To celebrate, click here for a recipe from PRESSURE PERFECT for SPLIT PEA SOUP. It always amazes me when I open the lid to see that after 10 minutes under pressure and the natural release, the soup is already pureed! No immersion blender needed. In the book itself, you’ll find lots of Transformations and Variations to change the flavor palate of this and the other 200+ recipes. Pressure cooking is fast-forward cooking, my kind of cooking. One of the great bonuses of travel is re-connecting with old friends. Soon after I arrived in Northern California, I saw Leslie Harlib’s by-line on a restaurant review in the local Marin paper. Soon after, I read that she was playing piano for a celebration of Russian and Yiddish music in Sausalito. I hadn’t seen Leslie in over 30 years and I took these reminders as a sign that is was time to re-connect. Thanks to Facebook, it was a snap to send Leslie a message. She wrote back quickly and The Sweetie (with video camera) and I met up with this remarkable Renaissance woman at her regular Thursday night gig at Marin Joe’s in Corte Madera. Leslie’s a hilariously gifted improviser . Click below and have a listen to the lyrics she created spontaneously to celebrate the pressure cooker! It’s based on the wonderful Rodgers and Hart classic, I COULD WRITE A BOOK. You can hear me laughing with surprise and delight in the background.